Dr. Sleiman Gebran has done his medical studies in the French Medical Faculty at Saint Joseph University in Beirut, Lebanon, where he got a Medical Doctor Degree in 1987. His residency and fellowship were done at Saint Joseph University (Beirut, Lebanon), Paul Sabatier University (Toulouse, France), and Louis Pasteur University (Strasbourg, France). He finished his training in 1994. Dr. Sleiman Gebran joined Saint George Hospital, University Medical Center, Beirut, Lebanon in 1995. He was a Consultant Paediatric Surgeon, Chief of Division, Assistant Professor at University of Balamand, from 1995 till 2007. 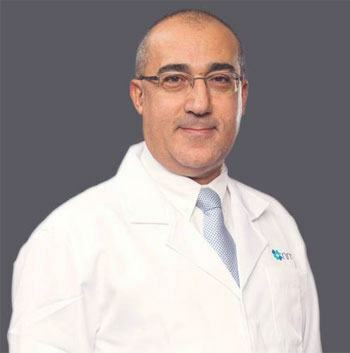 Dr. Sleiman Gebran joined Al Hada Military Hospital, KSA from 2007 till 2009, where he was a Consultant Podiatric Surgeon, acting Chief OD Division. Dr. Sleiman Gebran was associated with Mafraq Hospital, Abu Dhabi from 2009 till 2016, where he worked as the Chief of Division and Consultant Paediatric Surgeon. Dr. Sleiman Gebran joined NMC family in October 2016 as Consultant Paediatric Surgeon and is practicing at NMC Royal Women’s Hospital. His expertise is in Neonatal Surgery, Surgery of the Digestive and Uro-Genital tract in children. Dr. Sleiman Gebran is a Fellow of the American College of Surgeons (FACS), Fellow of the European Board of Paediatric Surgery (FEBPS), and holder of an MBA in Health Management. He is a holder of the French College of Paediatric Surgery Degree.